For as long as I can remember, I have never seen a cookie I didn’t want to eat. Yes, my sweet tooth isn’t quite as strong as my savory one(s), but cookies are in their own category of sweet. And to be more precise, chocolate chip cookies - are in their own awesome cookie world. Who doesn’t love a cute little (or big) chocolate chip cookie? They’re like the edible equivalent to a smile in the sunshine on a summer day. Or a fresh blanket of snow before anyone even considers shoveling. They just make you feel good. So when the internet became all a flutter with a couple cookie recipes that seemed to brainwash us all in an instant (all I saw on Insta for months were these cookies), I knew that my March baking feature would have to put them head-to-head (or cookie-to-cookie) against my gluten free baking test. And each other. But don’t worry. There are no losers here. Only cookies. Lots of cookies. Take note, dear readers, I have no shame when it comes to being a follower of super-hyped, super-delicious-looking dessert recipes. I held off for as long as possible and baked them both in one weekend. Essentially, I wanted to make these cookies immediately (they looked so good in everyone’s photos!) and I wanted to eat them yesterday. Lucky for you (and me), I’ve baked, eaten, re-baked, and enjoyed an immense number of these cookies to provide you with this month’s epic cookie battle. Well, it’s not really a battle. It’s a cookie convention, of sorts. A convention of the two (seemingly) most popular cookies on the internet right now. Let’s begin, shall we? Because after this, I need to get back to the gym! Note: I followed the recipe exactly as written and only made one adjustment. I used Cup4Cup gluten free flour instead of regular. 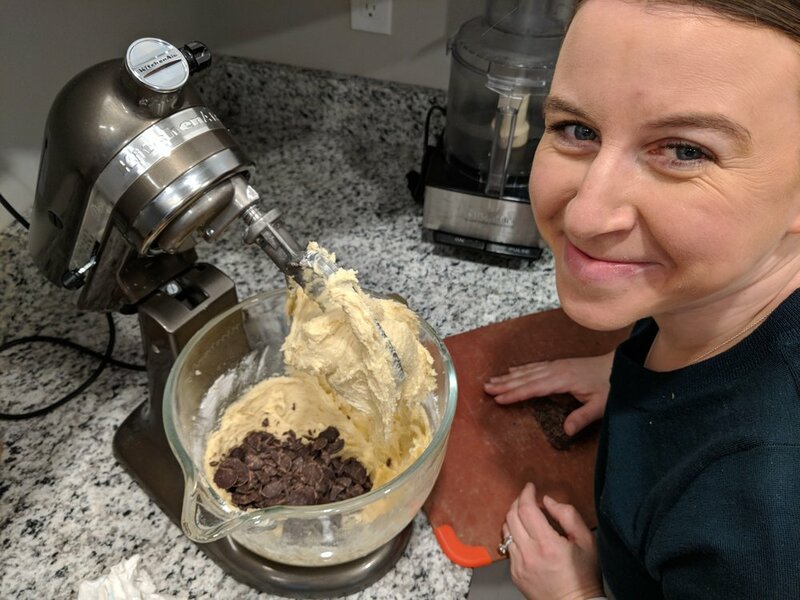 Lesson: the gluten free masses can still bake Internet-famous cookies! You don’t need to hide from these recipes. Just use GF flour and you will never feel left out again. You’re welcome. Memory Lane: What’s a cookie-baking bonanza without a little history, right? So I’ll serve up a short one since I’m sure you just want to skip this and get to the goods. But please don’t! Back to my chippy history lesson. My entire life has been surrounded by my grandmother’s chocolate chip cookies. I don’t remember the first time I ate one, but I do remember the mass number of them I had consumed up until my gluten free life began in 2013. It was a lot. My grandmother loves to wake up early. And since many people aren’t always up before 6AM (including weekends!) she always baked early in the mornings so by the time we’d talk on the phone, around nine or ten, she would often have already baked a batch of cookies or even had a second in the oven. Impressive! These cookies were magical. Mostly due to the fact that I never saw them being made and they would just appear whenever I felt the need to eat one (or a few). We always had containers of them in my parent’s house and as soon as the supply was fairly low, another batch would appear. How did she do it?! I liked that magical aspect, so I chose to never ask many questions about them; simply say thank you and then inhale the cookies. It was a true wonder how she could make so many, so often, any time anyone in our entire extended family needed/wanted cookies. Not to mention she sent these cookies to all of us cousins while we were away at college! And had a supply ready to go when anyone was home for a holiday break (to bring back)! These cookies became so popular among my friends and roommates during school that everyone always wondered when another batch would show up if only a few were left. And just like that, shipped like the crown jewel, more cookies would arrive to my dorm and subsequent apartments. Post-college, years later, and the event of my own Celiac diagnosis, my grandmother (Grammy) still baked the cookies, the classic chocolate chip, but now delivered to my dad, which he devours often and even has a special jar reserved just for them. Like clockwork, whenever she saw that my dad’s supply was low, or if she asked my mom if he needed more, another batch was ready in well under 24 hours. Magic! So, what does this all have to do with this month’s cookie showdown? Well, because I think baking is in my blood. Actually, chocolate-chip-cookie-baking to be precise. 1) Ingredients! You could use any brand of salted butter and chocolate for these, but I wanted an ultimate cookie situation so I went all-in and used Kerrygold salted butter and Guittard chocolate (marked GF by the way), so that my cookies would be as decadent as possible. I also splurged and bought a bag of Demerara sugar that the recipe called for. That bag wasn’t big and it was somewhat expensive, but I did make a lot of cookies and there’s lots left so I call it a worthy investment. 2) Instructions! As the recipe states, chill the dough logs for at least two hours! I can’t encourage this enough. For the first of the two logs I created, we waited a smidge under two hours before covering with egg, rolling in sugar, and then slicing for the oven. Yes, they came out well, but to this moment I wish we had waited longer. 3) Make ‘Em Last! Shelf-life can be iffy when it comes to GF baked goods. A sad statement, but accurate. However, when kept on a plate covered in tin foil, these cookies lasted well over a week! I was very impressed with how they remained crispy and delicious so many days later. Of course, eaten fresh from the oven is the best, but since we can’t eat entire batches in one sitting (I wouldn’t try! ), I’d say these are good to keep around for a “cookie-a-day” sort of lifestyle. If that’s how you roll! Egg-washed and sugar-coated. Ready to bake. Final Tip: Sprinkle with sea salt for a bit of “tang” on top of your cookie! Or leave it off to taste more of the butter and chocolate. I did the first set with salt and the second without; both delicious, but I’d say the shortbread-ness came through more without the sea salt. To each their own - cookie! 1) Ingredients! I chose to use Guittard bittersweet chocolate discs, which I then chopped up a bit to go into the dough. However, I may recommend using semisweet chocolate next time I bake these gems. The bittersweet was awesome, and did not make the cookies seem too sweet, in my opinion. I have a feeling the semisweet would give a more traditional cookie flavor and I’m excited to try that next. 2) Instructions! The recipe calls for dough dollops to be about 1/3 cup for each cookie. Following orders, this creates massive cookies (a couple of mine ran together while baking). Like, huge. I found that to be joyous and a very sweet outcome. However, some may find this size somewhat restricting if you want to share these with friends and family, which you will want to. Not everyone, sadly, wants to eat a cookie bigger than their face every time they want one. Hi! That’s me, baking early and often. 3) Pan-Banging! The author really does mean to bang the pan on the oven racks at the appropriate times during the baking process. Sure, it’s loud and somewhat worrisome (my precious cookies! ), but this trick to lift the pan and literally hit it against the oven racks works perfectly. I did this 3 times during each instance when the recipe said to lift and “drop” against the racks. Trust me - and the author mostly - this is the secret to those ripply cookies with soft centers and crisp edges. You won’t be disappointed! Final Tip: Much like the other cookies in this comparison, I stored these on a plate covered in foil, which worked well for keeping them on-hand for evening snacks throughout the week (another GF baked-good survival!). However, I’d say a few seconds in the microwave brought them back to just-from-the-oven bliss. If you want a hot cookie for dessert then make sure to “zap” it briefly before inhaling. Otherwise, they are still yummy, but a bit more chewy as the days wore on. SB: A little salty. A little buttery. A little crunchy. A lot of awesome. Wary I’d put in the effort and they wouldn’t live up to my (already) sky-high expectations, these cookies joyfully surpassed my fears and were downright fantastic. My husband gobbled them up (a few right off the bat!) and my parents loved them immediately. Those are my taste-testers, if you didn’t know. Seth and I obviously taste everything I bake, but I always want another couple, un-biased mouths to try whatever it is I’ve created. You could say my parents would think anything I make is great (awww), but don’t worry! They are honest and don’t sugar coat their thoughts if a cookie isn’t to their liking. My mom is a wonderful cook and baker so I trust her opinion on my skills immensely. And my dad will definitely say, “no, thanks” if the baked good isn’t worth a second bite. They know good food. The conclusion for this salted butter and chocolate chunk shortbread is that it stood up to the hype (I think) and gave it a big, fabulous high-five. We devoured several immediately and I could barely hold back from making a second batch later that same day. For all the worriers and critics and skeptics of this cookie that think it’s too good to be true and too easy to make for a crowd, well then, we just have to disagree. I cannot wait to make these cute, crunchy, salty, buttery, and scrumptious cookies again for friends, family, or anyone who wants to eat something sweet with a smile. PB: Now let me set the record straight: I’m not in this baking business (business? Who am I?) for the super-strenuous, hours-long process it can sometimes require. Until I am. And I suddenly dove head first into making these gargantuan, decadent, beautiful, and somewhat time-consuming, ultra-chocolate-y cookies. The baking itself wasn’t difficult, although I’m one to re-read each step of a recipe multiple times to make sure I follow it correctly. However, the pan-banging aspect of these cookies, the trick to make them terrific, was a minor learning process. I purposefully didn’t Google how to do this, since it basically came down to a simple action: in the set times noted in the recipe, open the oven, wearing your oven mitts, and lift up the baking sheet full of cookies. Then hit it against the rack a few times, set it back down, close the oven and let them bake two more minutes (repeat, etc). You’re banging the cookie sheet (pan) against the racks to remove the lift from the cookie and create a ripple effect. The end-result? Cookies that are perfectly crispy on the edges and sublimely chewy/gooey in the center, which is a combination I’m pretty sure should be referred to as a form of edible happiness. These chocolate chip cookies are very large. Like, bigger than my face (see below). Another facet that makes them perfect for gifts, sharing with someone you deem worthy enough to give half of your cookie to, or when you just want a supremely satisfying dessert (shouldn’t that be all desserts? Supremely satisfying?). As I mentioned before, I had my usual taste-testers and again, the reviews were glowing. And while they all knew we were kind of comparing these to the salted butter chocolate chunk shortbread of yesterday (I made both in the same weekend), they found it hard to find a reason or need to compare. These cookies were so completely different than the others and equally scrumptious. Be aware that due to their large size, they do become rather fragile. There is a potential for cracks if handled too much or if you grab one off of a plate too quickly (oops). But if I made them a pinch smaller next time, then maybe this issue would be moot. The only way to find out? I’ll just need to make another batch! Back to savory and I’m thinking pastry (maybe)! When’s the last time you had a cheese danish? Or a scone that was actually good? Or maybe sour cream coffee cake? I honestly can’t remember! But I do know I crave most of these goodies fairly often. Tune in next month to see what I’ll be baking as we head into spring - finally! Smiling over cookie dough. Per usual.